The Lyla Stretch Medical ID is the last word in flexible style! Lyla features two strands of silver beads and multi-faceted crystals, and boasts a sparkling cubic zirconia accent dangle in a sterling silver setting. As with all of our Stretch Medical ID Bracelets, the Lyla Stretch Medical ID is hand-stranded on high quality elastic, giving you exactly the look you want while allowing you to put your bracelets on over your hand: no clasping necessary! 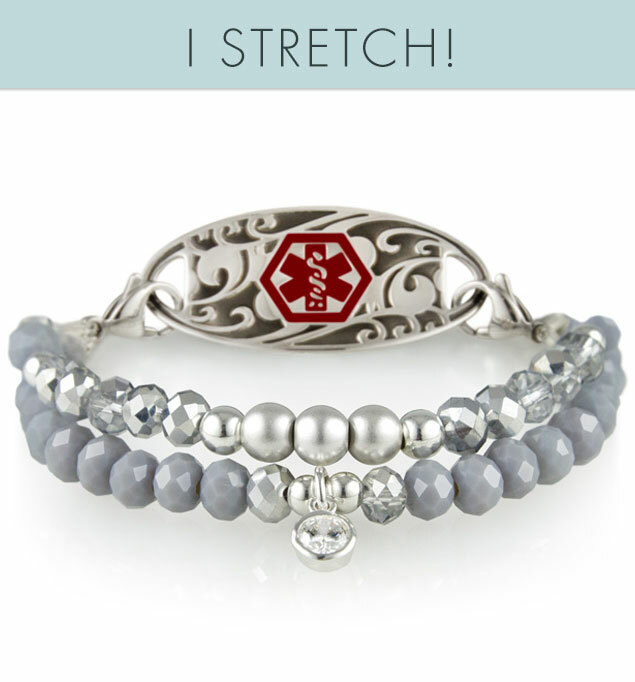 Your Lyla Stretch Medical ID bracelet pairs perfectly with any of our custom-engravable medical ID tags. They feature the internationally recognized medical caduceus symbol on the front, which alerts medical personnel to your information, engraved on the back. And because it’s interchangeable, you can move that tag from one bracelet to the next in a snap!